Despite the warm, humid weather we have been having, we officially welcome the first day of fall on Sunday, September 23rd. To celebrate, we will be OPEN SUNDAYS for the rest of the year from 10-4. This Sunday is VERY special for a few other reasons. We are hosting our very first CT/NOFA Create an Organic CT Day at Natureworks. We will be tagging monarchs. 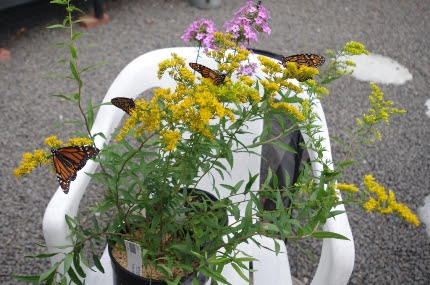 Join us and learn about fall flowers to feed the migrating butterflies this Sunday. NOFA is a group near to my heart as it is THE organization in our state that fights for organic food and trains landscapers in organic landcare. You don’t have to be a member, or a farmer, or even a big food gardener to enjoy this Sunday afternoon gathering (but if you are not a member, please join!) We will be sharing food and gardening information, I will be leading a garden walk and we will be tagging and releasing monarch butterflies. Kids are welcome- it’s a family day! I don’t usually work on Sundays, but this is a very special occasion. It’s a totally free event, but we ask that you register in advance so we can plan who is coming. Create your Own Bushel Basket Workshop is this Sunday. Register today with a friend! workshop Create your own Bushel Basket. 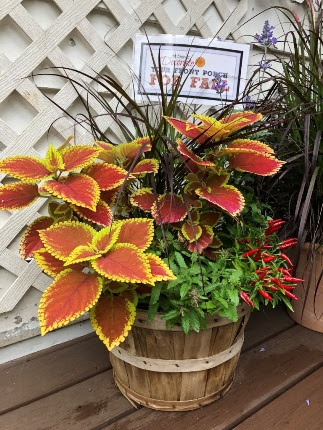 We will supply the plants, the organic soil, and the basket and guide you through the process of designing and planting a fall container for your porch or patio. Registration is required in advance. Please Click Here to register on-line or call the retail store. This would be a blast to do with a friend, and then stay for lunch and a garden walk afterwards. On Saturday morning, I will be offering a FREE design workshop in our teaching tent: Designing to Double your Color with Bulbs. Yes, our incredible selection of spring and early summer blooming flower bulbs is here. It can be daunting staring at all those bulb boxes, trying to figure out what to buy and then where to plant them. I will make this easy for you and, at the same time, we will explore some great, basic garden design concepts. 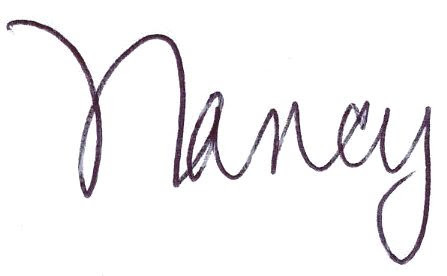 I am SO focused on design right now. I am preparing for our October 20th workshop Solving Garden Design Dilemmas with Karen Bussolini and Christine Froehlich. Registrations for this all-day workshop are coming in constantly. Be sure to register soon to reserve your spot. Click Here to download the flyer or Register on-line. Three wonderful Eupatoriums that I will be incorporating into my dramatic fall habitat border this Thursday night on Facebook Live. Speaking of designing, tune in this Thursday night on Facebook Live at 5 pm. I will explain how to Design a Dramatic Fall Border that will offer an “instant habitat”. This will include perennials, shrubs, grasses, herbs, and bulbs. This fall is the perfect opportunity to eliminate some lawn and plant a new garden. I haven’t seen the soil so moist in mid-September in years. The warm temps means that the soil is also very warm so the plants root in quickly. Fall is what we call the “Second Season” at Natureworks as we do so many landscape jobs in September and October. 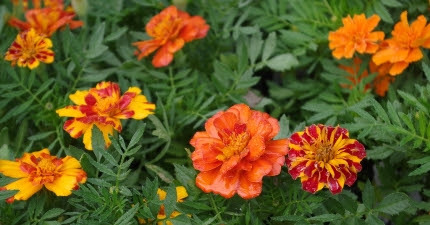 We have SO much fresh color including marigolds, ornamental peppers, asters, and more. Refresh your containers and gardens and enjoy a long, lingering warm fall filled with beautiful flowers. I haven’t seen much fall color yet, but when I returned from the Adirondacks I was captivated by the leaves on our Viburnums and twiggy dogwoods. I just returned from 6 days up in the Adirondacks. The weather was hot and sunny, amiracle! There wasn’t much fall foliage yet (the nights have been too warm) but I saw lots of monarch butterflies at camp and while traveling. The roadsides were filled with asters and goldenrod and perennial sunflowers. The woods were overflowing with asters and goldenrod and I even spotted some native white turtlehead. We have so many monarchs being born every day, and lots of chrysalises and caterpillars too. It is SO important to plant lots and lots of nectar flowers in your garden, in school gardens, in parks, and public spaces. 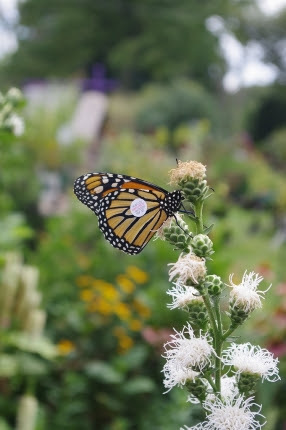 Not only do the monarchs need the nectar, our native pollinators do too. Fall also means that berries are starting to ripen on our shrubs. What a difference a week makes! 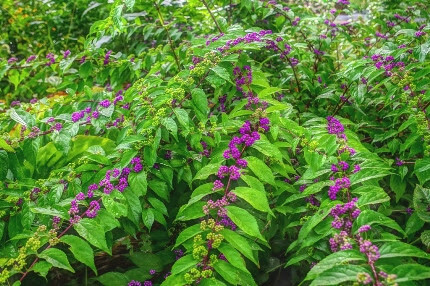 The beautyberry (Callicarpa) in our front garden suddenly has its brilliant purple berries, and they will last until Thanksgiving or later. My winterberries (Ilex verticillata) also changed to red and orange while I was away. Fall not only means flowers, it also means colorful leaves and fruit. 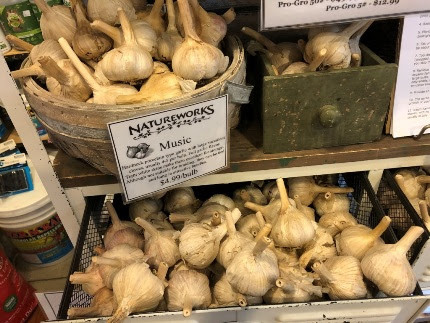 Yes, we do have organic hardneck seed garlic and more to come. 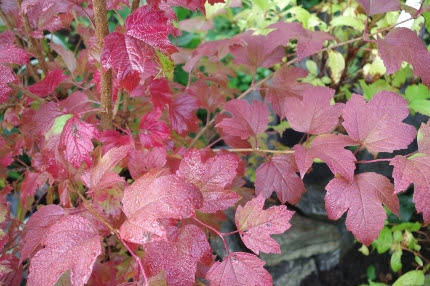 Plant in October or November but buy it now and store it in a cool garage or shed to be sure you get what you want. We usually sell out. for above ground plants on Saturdayand Sunday and then we will have a full moon. After that, I am planting radish seeds big time. Keep on planting folks. 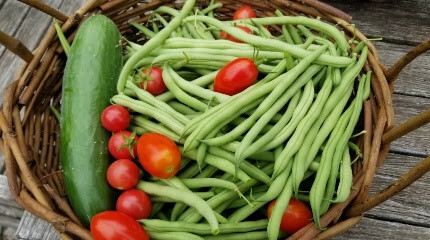 There hasn’t been a more perfect September to extend your food growing. Take advantage of the warm weather and deep moisture in the soil. An easy way to add to your garden is to buy and plant up a few Smart Pots now and fill them with our organic potting soil and compost. You can leave them outside all winter with the soil in them. In the spring, you will be thrilled to have them all ready to plant as early as the weather allows. Yay! 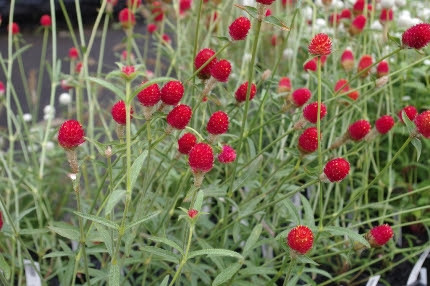 Red globe amaranth is back in stock. This is a great flower for containers, the garden, and for fresh cut and dried arrangements. For the past few weeks, I have been trying to really learn the difference between the different goldenrods that we sell and those that grow in our gardens and in the wild. I made a “cheat sheet” for my staff, and will focus on some of what I am learning in this email for the next couple of weeks. Read my article below to learn more. Join us to tag and release monarchs on Thursday, September 20th and Saturday, September 22nd at 1 pm. We will not release if it is raining. We have so many butterflies being born every day, we probably will be releasing even more days. Call in advance if you are traveling a distance to join us. days a week as we begin our fall hours. 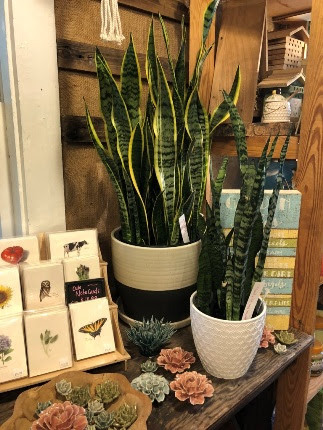 The inside of the shop is as fun as the outside, filled with houseplants, succulents, bulbs, and lovely gifts. We have meadow seed, grass seed, as well as lettuce, spinach, radishes, and any other seeds for the edibles you can still plant. As nice as it is to travel and relax, there truly is no place like home and I am happy to be back and to settle into my regular gardening, harvesting, cooking, writing, and designing routine for the rest of the growing season.